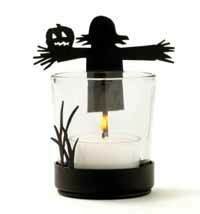 Halloween themed votive candle holders, hurricanes, tealights, pillars, and more for your spooky home decor or party! Drip-less, smokeless, and available in a wide variety of colors! 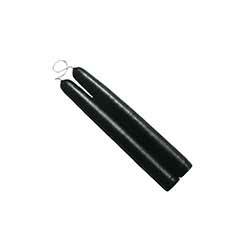 This is for the 6 inch candle in the Solid Black color. Drip-less, smokeless, and available in a wide variety of colors! 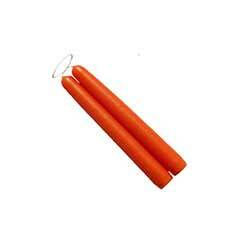 This is for the 6 inch candle in the Sunspot Orange color. Unscented tealight in a protective metal cup. Comes as a set of six - 3 black, and 3 orange. Burn time is 2 hrs each. 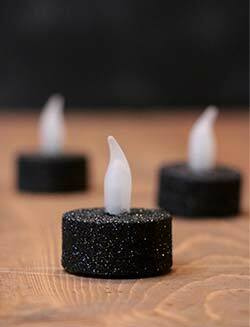 These Black Glitter LED Tea Light Candles are perfect for your party, event, wedding, or halloween decor. Flameless tea lights are pretty and worry-free! 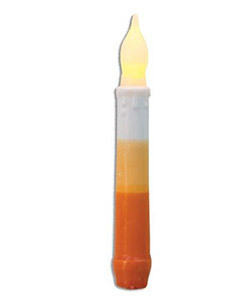 This festive battery operated 4 inch pillar candle has been dipped in orange, yellow, and white wax for a candy corn effect - great for a shelf, table, or windowsill for your Halloween decor! 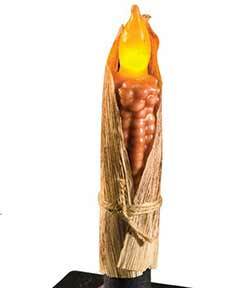 This festive battery operated 6 inch pillar candle has been dipped in orange, yellow, and white wax for a candy corn effect - great for a shelf, table, or windowsill for your Halloween decor! 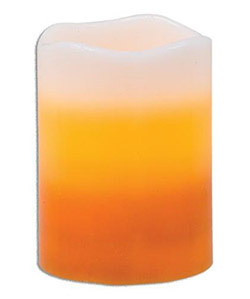 This festive battery operated taper candle has been dipped in orange, yellow, and white wax for a candy corn effect - great for a shelf, table, or windowsill for your Halloween decor! 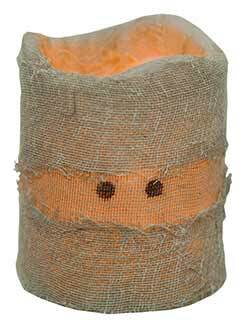 This primitive fall candle is mummy wrapped with grungy gauze, with two beady eyes peeking out - great for a shelf or table for your Halloween decor! 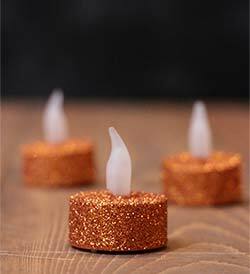 Orange Glitter LED Tealight Candle, by Our Backyard Studio in Mill Creek, WA. Our battery tea light candles are hand-painted and coated with superfine, super sparkly glitter. 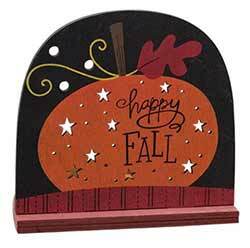 Perfect for your party, event, home, or holiday decorating needs! 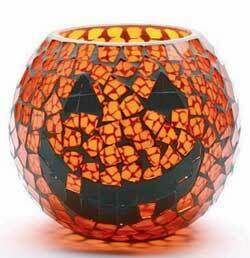 This is for the ORANGE glittered tealight. 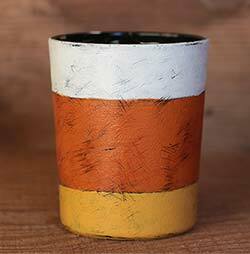 Measures 1.5 inches in diameter, and 1 7/8 inches tall. Has a gentle flicker. Turns on/off with a switch on the bottom. Glitter is well adhered with minimal shed. Uses one CR2032 Lithium battery - one is included, plus we toss in an extra "just in case" battery for free! Price is for a single candle, with battery, plus an extra battery. Lots of other colors available too! 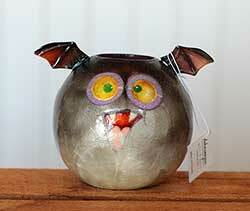 Pumpkin Face Ball Candle with Tealight, from Your Heart's Delight by Audrey's. 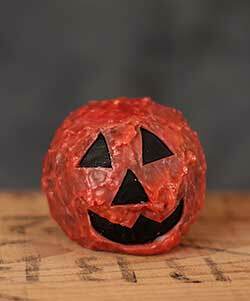 Perfectly primitive with its bumpy lumpy texture, this ball candle is a lovely orange color with a carved Jack-o-Lantern face! 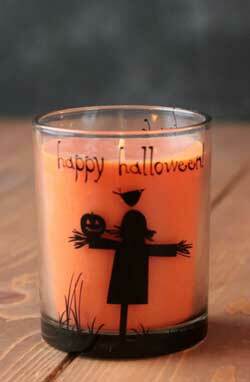 Pumpkin Face Taper Candle, from Your Heart's Delight by Audrey's. 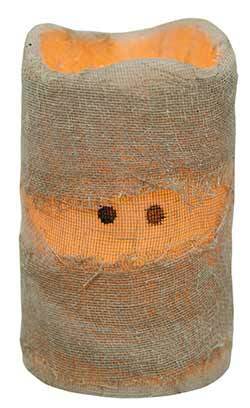 Perfectly primitive with its bumpy lumpy texture, this taper-sized candle is a lovely orange color with a carved Jack-o-Lantern face! Pumpkin spice fragrance. Measures 6 inches tall. 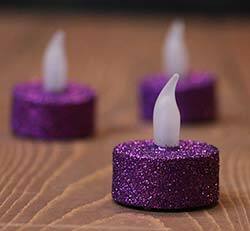 Purple Glitter LED Tealight Candle, by Our Backyard Studio in Mill Creek, WA. Our battery tea light candles are hand-painted and coated with superfine, super sparkly glitter. 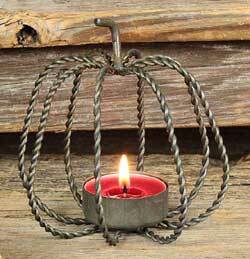 Perfect for your party, event, home, or holiday decorating needs! This is for the PURPLE glittered tealight. Measures 1.5 inches in diameter, and 1 7/8 inches tall. Has a gentle flicker. Turns on/off with a switch on the bottom. Glitter is well adhered with minimal shed. Uses one CR2032 Lithium battery - one is included, plus we toss in an extra "just in case" battery for free! Price is for a single candle, with battery, plus an extra battery. Lots of other colors available too! 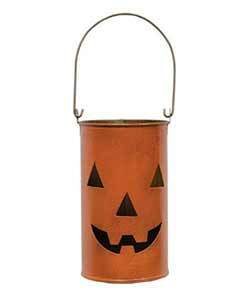 Spice Jar Candle with Halloween, by Primitives by Kathy. This highly fragranced jar candle features artwork from the ever-popular box signs. 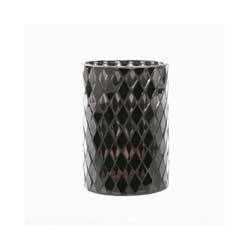 Candle color is black, and the scent is Spice - harvest apples spiced with warm cinnamon and clove. 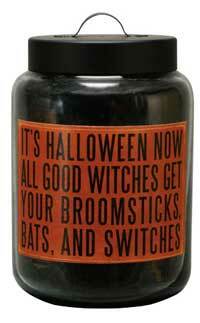 Artwork reads: It's Halloween now, all good witches get your broomsticks, bats, and switches. 26 ounces, with approx 150 hour burn time. 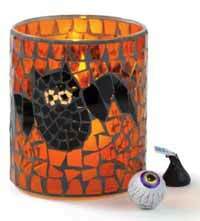 (If Halloween has passed, you can turn the candle around so you just see the wax and not the artwork). 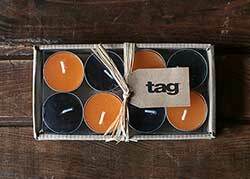 Box of 12 of assorted orange and black mini candles, perfect for a festive cake!. Burn time is 35 minutes each. Measures 5 inches high.